Wildwood Press: Mark Marking was on display in Terminal 2 between gates E33 and E34 from December, 2017 through March, 2019. It was a mix of pop culture, wallpaper and a whole new audience at St. Louis Lambert International Airport. In partnership with the Contemporary Art Museum St. Louis, the Lambert Art and Culture Program welcomed the installation of the renowned German artist Thomas Bayrle’s Chrysler Tapete. The work, made up of 66 individual panels of wallpaper was mounted directly to the wall in a grid pattern on two separate walls. Chrysler Tapete was on display in Terminal 2 between gates E33 and E34 from March, 2018 through through March, 2019. Time Won’t Give Me Time, is composed of two pieces, Disco and After Party, that both reflect the tumultuous time of the gay community in the 1980’s. Disco is composed of three triangular mirror plinths each holding a different color of sand and glitter. After Party is composed of a black disco ball atop a mahogany base, loosely in the shape of the top of a coffin. Exploring juxtaposing feelings of joy, fear, rage, and sadness, Anschultz is able to celebrate the new possibilities of and memorialize the 1980’s as a time of deep transition within the gay community. His work pushes the imagination to places with strong emotional connections, while simultaneously celebrating the chaos that accompanied the time. Time Wont Give Me Time was on display in the Terminal 1 Ticketing Lounge May, 2018 through November, 2018. Empowerment from Within: Yoga and Our Youth focused on celebrating the movement of urban communities that pair yoga with youth in safe spaces. By promoting physical and mental well-being in his work, Bayoc allows viewers to explore the notions of focus, empowerment, and self-control through the eyes of children. His playful colors, presented within the context of youth and movement, will subtly encourage viewers to embrace slow, controlled action. Composed of six shaped polymetal and acrylics pieces, Warrior, Firefly, Flying Pigeon, Seek Enlightenment, Balance, and Queen Pigeon. Empowerment from Within: Yoga and Our Youth was on display in Terminal 2, between gates E18 and E20 from May, 2018 through November, 2018. Capturing Imagination includes 16 chess sets and artifacts from the permanent collection of the World Chess Hall of Fame. Visitors will marvel at beautifully-sculpted, resin chess pieces including Avengers: Infinity War characters Thor, Spiderman, Captain America, Iron Man and Black Panther. Playful sets, featuring characters like internationally-adored Hello Kitty, sitting atop a chess board that doubles as a collector’s tin and cast, hand-painted pieces from Winnie the Pooh, will charm kids of all ages. Science fiction fanatics will set their phasers to fun with a Star Trek tri-dimensional chess set, beaming with precision-cast pieces coated in sterling silver and 24-karat gold. Other pop culture icons such as Snoopy, Fred Flintstone, Miss Piggy, Big Bird and Bart Simpson appeal to all generations. Capturing Imagination was on display in the Lambert Gallery from May, 2018 to November, 2018. 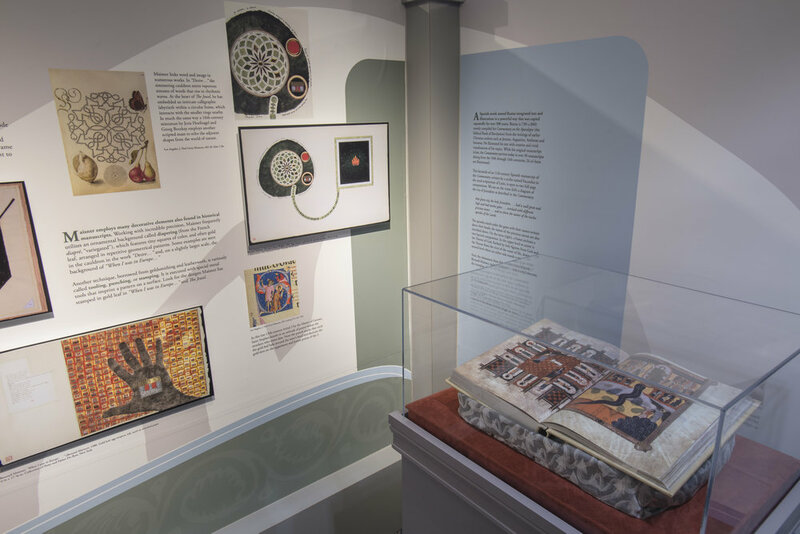 Beyond Words highlighted the continuing influence of manuscript illumination. This exhibition includes work from Salma Arastu, Archie Granot, and Bernard Maisner, along with examples of historical manuscripts curated by the Museum of Contemporary Religious Art and Saint Louis University Libraries Special Collection. Beyond Words: Three Contemporary Artists and the Manuscript Tradition was on display in the Lambert Gallery from May, 2018 through November, 2018. St. Louis artist Addoley Dzegede merged international symbology, patterns, and color from around the world for a 12 ft.-wide silkscreened pigment on cloth work that was inspired by the artist’s post-graduate apprenticeship at the Fabric Workshop and Museum in Philadelphia in 2015. She explored a 5-block radius around the museum to select motifs found in architecture to create a repeat pattern. 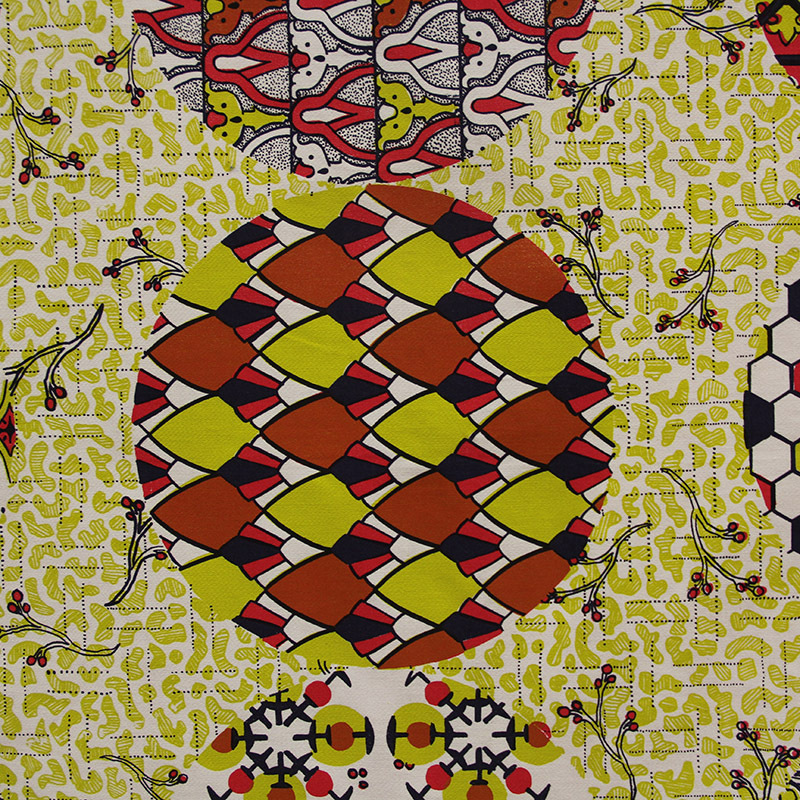 However, she used a color palette commonly used in Dutch Wax prints that pays homage to Dutch, Indonesian and West African textiles. This was the largest installation of Here and Elsewhere; smaller sections have been on exhibition at the Fabric Workshop and Museum in Philadelphia. Here and Elsewhere was on display in Terminal 2 between gates E10 and E12 from April 2018 through November, 2018. The solar system is full of mysteries, and artist Eric Woods, owner and founder of The Firecracker Press, let his creativity soar into space with the creation of The Solar System Series. This intricate, multi-paneled work is letterpress printed on paper, from hand-carved woodcuts and other recycled materials like cardboard and vinyl siding. Each panel was printed individually over the course of several months, then pieced together and mounted on wood. The Solar System Series was on display near the A Gates entrance/exit in Terminal 1 from October 2017 through October, 2018. The four elements of life inspired local artist Carol Carter in her vibrant watercolor art now showing at St. Louis Lambert International Airport titled, Elements. The dynamic exhibition features four large, original watercolor paintings mounted side-by-side depicting her artistic interpretation of air, fire, earth and water. “Each aspect of my work is mysterious, seductive, intense, and inviting,” said Carter, who describes her paintings as containing duality: clarity and ambiguity; sanctuary and threat; pleasure and pain. The use of vibrant, saturated-color contributes to the tension between these extremes. Elements by Carol Cater was on display in Terminal 2, between gates E10 and E14, from October, 2017 through May, 2018.